Southport, CT October 29, 2008 – Sturm, Ruger & Company, Inc. (NYSE:RGR) announces that it has recently received a small number of reports from the field indicating that LCP pistols can discharge when dropped onto a hard surface with a round in the chamber. 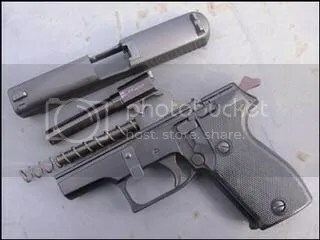 Although no injuries have been reported, we are firmly committed to safety and will retrofit all older LCP pistols (described below). The retrofit involves installation of an upgraded hammer mechanism at no charge to the customer. The new parts are being built and we will retrofit LCP pistols on a first-come, first-served basis as soon as they are available. When Ruger is ready to retrofit a consumer’s pistol, Ruger will send a shipping label and package with instructions for the FREE return of the LCP pistol to our factory in Prescott, Arizona. Ruger will install the new hammer mechanism, plus some other functional upgrades that have been added since the LCP’s introduction, at no charge to the consumer and the pistol will be returned at Ruger expense. All owners will receive a FREE LCP magazine with the new finger grip extension as a “thank you” for their patience and cooperation. About Sturm, Ruger: Sturm, Ruger was founded in 1949 and is one of the nation’s leading manufacturers of high-quality firearms for the commercial sporting market. Sturm, Ruger is headquartered in Southport, CT, with plants located in Newport, NH and Prescott, AZ. Syd is a good friend and we share many of the same views on current and future trends we can expect to experience if Obama is elected. Hang onto your guns people and stock up on ammo and mags as well as any black rifles you want. The future is not bright for all of us sportsman and we must be prepared to be active in the protection of our rights under the constitution. Please take the time to listen to Syds Podcast! Just click the link marked “Syd’s Podcast” listed above. As many of you know the German Police or Polizei have switched to the H&K line of handguns. 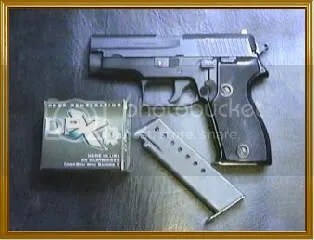 All of the old Sig P6’s, or as we know them here the Sig 225, have been imported by Century International for sale in the USA. Conditions on these guns varies from good to very good. Most have not been shot very much and most wear is from holster carry. Of course this is true whether it’s an American trade in or a German trade in. You can certainly get a fantastic bargain on this particular pistol. The Sig P6 is imported for sale in the standard blue Sig case with two magazines supplied. 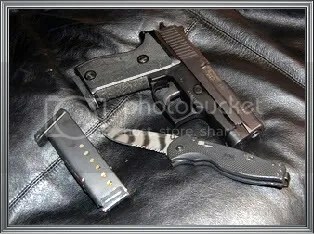 Most dealers who carry these fine pistols sell out of them as fast as they get them in. It’s no wonder! Where else can you purchase Sig quality for around $300 to $350! This model Sig is essentially a Sig 226 in compact form using a single stack mag configuration with the mag holding eight rounds of 9mm. I owned the American version P225 back in the mid 1980’s and found it to be a very fine pistol with outstanding accuracy. 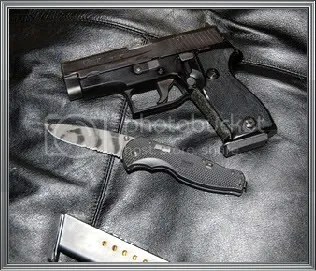 It also is thinner than most compact pistols such as the Glock and conceals very well. I know many shooters feel that you should at least have 13 or more rounds of 9mm to be considered well armed. I take issue with this view. I feel that if the first mag doesn’t get you out of trouble and the situation resolved your are most likely in deep trouble! On the way home is a public range so after a quick stop at Wal-Mart for some white box 9mm I stopped and fired about 50 rounds. It shoots just as well as I remember. Having shot the 1911 so much it will take a bit of time to become accustomed to the Sig trigger again but that’s really no big deal. I used a shooting C target in the 5 inch size. With other shooters on the line I couldn’t move into my usual range evaluation distances so all rounds were from the 25 yard line. Even with my struggling a bit to get used to the trigger again and people shooting AR’s on both sides of me making me dodge brass all rounds went into that 5 inch target no problem at all. In fact three rounds went right through the red bullseye:-) These are just very accurate pistols period and always have been regardless of model or frame size. 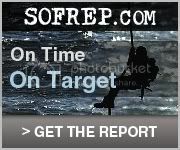 I’ll shoot some evaluation rounds when I get an opportunity and post the results here. 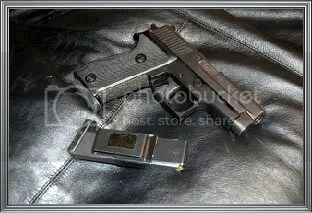 This pistol is a real bargain and worth looking for one especially at these prices. I did pick some fresh carry ammo that I have heard nothing but good about. It’s the Cor-Bon DPX which uses the Barnes solid copper bullet with a very deep hollowpoint. This is a 115 grn. +P round at 1250 fps and 399 ft/lbs of energy. In testing this round retains 100% of it weight and expands to twice the bullets original size. It also expands every time according to those who have done extensive testing. They have taken this round and fired it into two layers of clothing and a leather jacket with complete penetration and full expansion in the ballistic media behind the clothing materials. They have also tested it against auto glass and doors and had complete penetration on these materials with full expansion coming out the other side and still retained almost 100% bullet weight. That’s pretty amazing but Barnes is known for making very effective bullets and most folks know that Cor-Bon is usually on the cutting edge of ammo design. I did some measuring which is rather revealing. The cavity of the hollowpint is very deep at 3/8th of an inch with the mouth of the cavity at 1/4 inch wide! That is one mean looking round looking at it head on. Several law enforcement agencies have gone to this round with very effective real world one shot stops in 9mm and 40 caliber. This may very well be my carry load in all calibers if the results continue as time goes on and more police shooting results come in. Between the solid copper bullet and high speed of the round I would expect no less. One other note- there have been no recorded instances of over penetration in real world shootings. Hopefully I’ll be able to post some additional evaluations in the next week or so and get them posted. Bottom line is if you can acquire one of these Sigs it’s a real bargain you won’t be sorry you purchased! One other thing. I have to apologize for the poor picture quality this time. I had to use the picture capability of our video camera which doesn’t take the best pictures. Safe shooting and as always any questions or comments are welcome. I went to the range today to shoot my 200th round of ammo through this fine little gun. The picture above was fired at 10 yards. I drew and fired and fast as I could realign the sights. Total of eight rounds with some going into the same hole. I mentioned how accurate these pistols are as are all Sigs I’ve ever shot and I’ve shot about everyone they make except for the latest P250. The ammo was the Cor-Bon DPX 115 Grn.+P with the Barnes solid copper bullet mentioned above. You can get a good feel for the group size by comparing it to the magazine size. I have shot Remington 115 grn, Cor-Bon, Winchester, CCI and Remington 124 grain and finally Hornady TAP. All fed without a hitch and honestly I expected nothing else. Since the early 1980’s when I shot my first Sig 220 European I’ve never had a malfunction and that’s saying a lot. It’s the only brand I’ve ever shot that has never malfunctioned! I do intend to replace the trigger spring with a lighter weight Wolff spring as I did on my H&K USP Compact. It should lighten the double action trigger pull and still provide reliable ignition. I’ll let everyone know how it works when I make the change. Replacement is simple by removing the grips which exposes the spring. Replacement should take maybe 10 minutes if that. 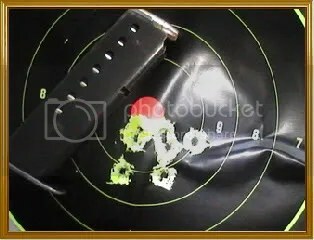 This target is from 10 yards to 25 yards firing as you would practice for a critical situation. In other words pretty fast. There were a total of 50 rounds fired using Winchester white box.It’s unique for me but with the first long double action trigger pull I usually hit where I aim. 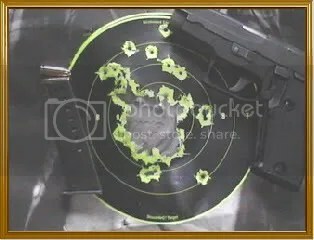 That just a Sig and the way I shoot I suppose. The rounds that are a little off are single action shots from 25 yards. They are still in the the 8 inch target though so I’m pretty pleased. No malfunctions as usual even when I mixed various brand hollowpoints in one magazine. Thanks to all for reading the blog! 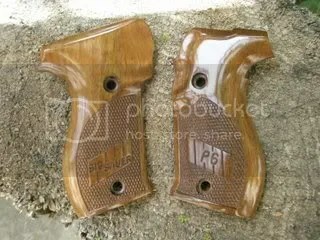 Many people have been very curious about why these pistols have a notched hammer myself included. I spent a great deal of time searching the internet looking for photos of Police carrying the Sig. I found a grand total of two. 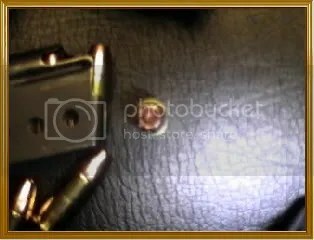 Between the two photos it appears there is a piece of material that attaches to the notch in the hammer then to the trigger guard or holster itself. It appears that maybe this is so that if the officer fires his weapon the material breaks. Or if the weapon is drawn the material breaks. I suppose this is one way of keeping track of an officers gun handling. The only problem is if that is indeed the case the material would have to be very flimsy to not interfere with drawing and firing unless it is attached to the holster.. Accidental breakage would seem to me to be very easy but then the holster in one picture has a flap. The flap was open in the picture. I tend to lean toward the weapon being attached to the holster. If anyone has information to the contrary please let me know. I ran across a new manufacturer of AR15’s named CMMS. They are a small company in Fayette,Missouri. I stopped in to Mark’s Armory and saw this AR and saw that it was a bit different than most run of the mill examples. The lower is a DPMS with collapsible six position stock. The upper is the heavier variety found on match AR’s. The upper is also from DPMS and is the upper used on the Panther Race gun. In fact the upper is almost twice as thick as the steel on a standard model which makes this rifle more stable and therefore more accurate as it turns out.The upper is also made from extruded aluminum alloy. There is no forward assist or dust cover which is fine for the average shooter. The foregrip is a free float barrel type with an M4 chrome lined barrel from DPMS. All of the parts used are very good quality. Another addition that CMMS added is a cheek rest from Command Arms. This rest is very easy to add to any AR15 and provides a very good cheek weld when sighting. It also has two water tight compartments for carrying battery’s or other odds and ends. It an excellent addition for your AR. After deciding to take this one home with me and hoping my wife wouldn’t kill me I saw some scopes that looked a lot like an ACOG. Not being one who can afford an ACOG I was interested. The company that makes these is NC Star. I know I know they are inexpensive but not cheap if you know what I mean. I expected an $85 scope to be blurry and just not very clear at all. I was surprised to see that I was wrong the optics are very clear as is the Mil-Dot reticle. There is a rheostat on the left side that runs off a watch type battery. Turning the knob clockwise the reticle turns green with one more notch dimming the reticle. Turning it counterclockwise and the reticle turns red. Handy for low light situations. With the power off the reticle is black. 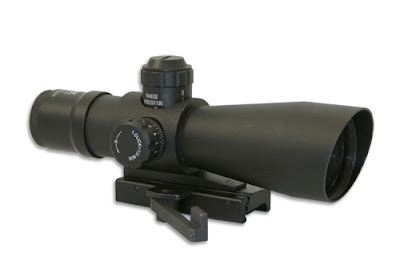 It has an eyepiece adjustment for nearsighted or farsighted people at the rear of the scope. They make several variations of this scope but this one is a straight 6X42. At the top is a knob for bullet drop calibrated for a 62 grain .223 round. Range on this 100 to 500 yards. The reticle as mentioned before has the Mil-Dot crosshairs if you choose to use this feature instead especially if you happen to use a different load than what the scope is calibrated for. The knob on the right side is the standard right and left windage adjustment. One click is 1/2 inch at 100 yards. Mounting is very simple since this scope uses a lever to lock the scope in place. Removing it and replacing it had no effect on the zero. We’ll see how it holds up over time and many rounds of recoil. So far it works very well. After this group I used a sanbag rest off the bench and had groups that averaged about 1 3/4 inches using Black Hills 62 grain match ammo. I moved back to 200 yards and had groups open up to a bit over 2 7/8th inches with the same ammo. This is certainly better than the groups I’m used to with the standard AR15 having the stock upper and non free floated barrel. This is certainly not your stock configuration but it looks good and shoots very well. To get a nice AR such as this one for $680 and a decent scope for $85 it won’t break the bank. With the elections coming up very soon and should Obama win you better stock up on ammo, hi-cap magazines and any “black rifle” you have been yearning for because if he gets in office the push to take away our guns will be a high priority with him or so he has said. If you think the last assault weapons ban was bad you ain’t seen nothing yet! On the main blog page at the top is a link to Mark’s Armory if you are interested in an AR15 like this one. You sure can’t beat the price especially for what you get! As always I wish you safe shooting and an enjoyable time at your range. Remember comments and questions are always welcome.